It’s now a full week since our Bach for Advent experience. We had a one-day workshop during which we tested the water and made many new colleagues, some of whom joined us later, including a lovely musical colleague singing alto from near Vienna who now lives in Dublin. In the end the whole Alto line in Choir 1 were German speakers, and so our community grows! We took advantage of the excellent learning tools…Gareth’s line recordings, Volker Lahman’s CDs and that Carus app!..to prepare for the actual rehearsal weekend. The weekend was two intense days during which we made loads of progress, 2 more weeks of personal learning and then the rehearsal / performance weekend, when some of our fantastic German colleagues from our foundation Mahler 2 event joined us again. Final touches went into the personal note learning, but the rehearsals became intense exercises in both technical accomplishment and the expression of musicality both. Our Musical Director, Brian, has a consistent and valuable mantra for first views of the piece; flick through the pages and learn the ‘geography’, ‘landscape’ or ‘architecture’ of the sections within each piece and their feel and progression. I’d have loved to say ‘anatomy’ of the piece, and while it doesn’t quite have the same ring, the systemic design that is inherent in Bach’s music does have a visceral quality. This trick Brian applied during the workshop and at the start of each rehearsal weekend. It was something he was to return to for the performance. As Brian puts it, embedding the music and feeling it ‘in the body’, is something which I imagine we may carry with us on the journey we have started as a group of musicians. One of his interesting treats was to tell us how our convention for learning repertoire contrasted with continental Europe. Brian emphasised that learning a piece is not about learning the notes. The starting point for learning something in a way which will enable expression is to already know the notes and thereafter only to focus on what the composer meant as a meaning which rests through and beyond the music. Too often we have been conditioned to work off one piece until grasped, then move on to another piece only to work on progressions and coherence nearer the performance. While we did lots of work like this, Brian kept us working through the pieces by going though them as in the programme like good Europeans. The effect was to connect them together from the start and show how the music progressed, and also that we realised in timely retrospect that all was interconnected, ahead of the performance to be given. All this was determined by a careful rehearsal masterplan. It was a delight to have that plan explained to us. We rehearsed in the exact arrangement to be used in the concert throughout, in ‘C’ around Brian, helping us to hear each other and get used to it. Oh, and what about that tip about the finish? Brian brought a musical insight to us, similar to his workshop. What is the difference between a Classical and a Baroque finish? The drama and power is there in a magnificent Wagner or Mahler finale, with finishing chord after chord and crescendo, but contrast the Baroque, which does not need crescendo; the rhetorical Baroque chamber style can even seem nonchalant, like ‘we just did this, and it was brilliant and now we are done, Fin.’ Ooh, didn’t we love that! As prepped as we could be, joining with the ensemble and soloists would be a critical juncture. This was to be an intimate arrangement. The upper 3 voices would be arranged directly around the ensemble with the 10 basses behind the smaller number of tenors. I was standing right behind the seated cellist, beside the double bassist and looking directly across the 2 standing oboists. We were all delighted by beautiful oboe passages in the cantatas. We were even more fascinated by Chris and his oboe de caccia, a curved instrument that is a defining feature of the Baroque era and Bach in particular. To our right were the standing viola and violin players, with the whole ensemble arranged as a c-shape around the conductor, enveloped by the choir. The instruments would mirror the voice parts instrument to voice. The physical and mirroring arrangement was very Baroque as was the pitching at a semitone lower than modern pitching and on gut strings with Baroque bows (a completely different tension on the bow hair) bringing the music to life and adding the beautiful dance quality that electrified our singing. Pomp and circumstance it was not, the whole feel was period in a sense that we wanted to reconnect with the fluidity and informality of the Baroque chamber as what it was, a musically innovative space, and Brian had an express purpose to excavate that wonderful spontaneity rather than impose a classical formality. This was real colour, disciplined instinct, and the fluidity of art and expression unrestrained by powder, paint and wigs. It helped cohesion of the whole group and was to be crowned and amply encouraged by the venue. Newman University Church opens from St. Stephen’s Green square by an unobtrusive portico. The simple white entrance hall steps down to a great, carved dark wooden screen and doors and, when they open, the visitor enters a plain narthex lit by offertory candles below the gallery which ends in an arched colonnade, giving a glimpse of the church proper. And that glimpse is one of the most rich sights I have ever seen. As you approach from the place of the catechumens, the view opens into a an immense glory of variegate marble panels, painted wooden inlays above arch patterns and above that the gloriously vibrant restored religious story panels which ring round the church. As lovely as all this is, the focus is clearly the sanctuary. The high altar was surmounted with immense candelabras and above that is a stunning golden semi-dome centred on Virgin and Child, surrounded by higher angels and saints, inscribed ‘sedes sapientia’. As was commented by one of our members, gold, just enough and not too much, isn’t that right Caitriona? (*Indeed, she says, it is just the right amount*) This was deeply neo-Byzantine (Des kept me right here) and deeply western Catholic but just Eastern enough to hint at an unexplored devotional world. The lighting bathed the church in a warm, golden glow and was perfectly judged. It made so many of us smile within and without, knowing that the venue would set the scene and compliment the music in atmosphere. The acoustic was fabulous, but crisp and unforgiving, so Brian reinforced all his messages but now they had particular effect on the afternoon leading up to the performance. Remember the tone is on the vowels, but the consonants need not just emphasised, but even exaggerated in their ending. The syllables must be clipped just at the very end after resonating, and the consonants enunciated as separate from each other to allow them to be heard distinctly; consonants clipped at the last second, for a sharp acoustic. We must end a phrase with energy and allow energy in the silence, and while we may have uttered the sound, the music has not ended until the sound has whirled up into the building and has fallen again. The effect was powerful. If was so powerful, that our musical director, who stands and moves like a matador and has such control as a conductor, laid down his baton to pause and put his hands over his face for a second as he did so, preparing to speak. Brian talked movingly on the level of musical professionalism we were achieving that afternoon, despite being amateurs with busy and unrelated day jobs. 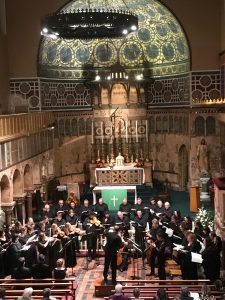 He has a remarkable ability to engage the choir and the choir can be very responsive to him, but in that moment we felt a profound bond with him and a feeling we were going to do good that evening. At that point our transformation from rehearsal to performance mindset was ignited. Our running order started with BWV 61 Nun Komm der Heiden Heiland and BWV 36 Schwingt Freudig is euch empor. How I enjoyed rolling my German ‘r’ as Isang ‘freudig‘! Those chorale harmonies, the arias and recitatives that brought tears to the eyes, those faster passages which such lovely rhythm and attack, des sich Wundert alle Welt! 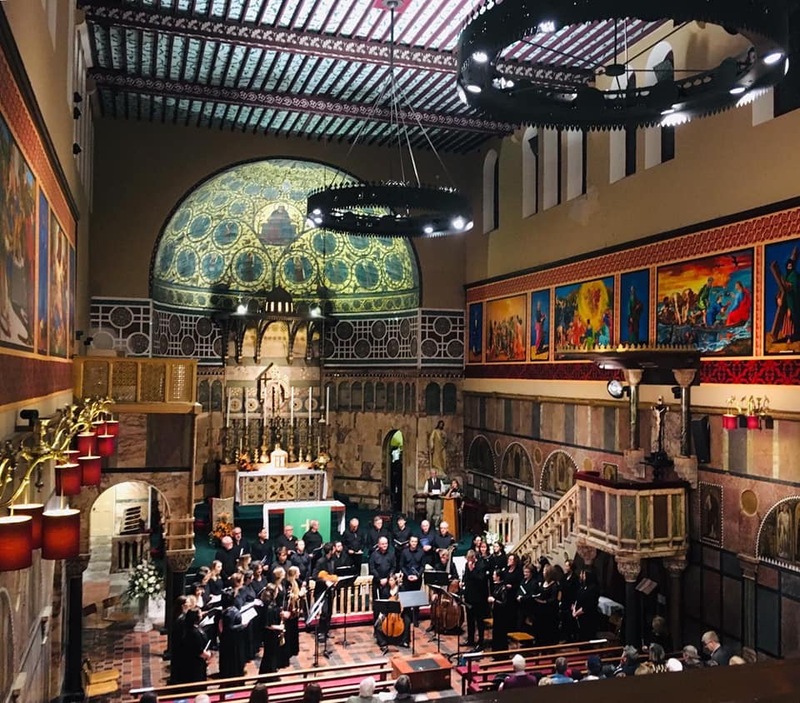 The soloists were fabulous, Soprano Charlotte Trepess, Tenor Peter Harris and Baritone Aaron O’Hare of Sestina Singers, a group of superb quality. I think many members of the choir wanted to take these wonderful singers home and keep them for next time. We had a brief relaxed break and returned knowing it all felt good. Oddly, given the imposing beauty of the venue, capacity crowd and demands of the music, we felt relaxed and the group atmosphere was far from tense. Coming back in with BWV 62 Nun Komm der Heiden Heiland was a delight for us tenors with the lyrical nature of our opening lines and choral entries punctuating the gorgeous ensemble playing. A breath, and we were at BWV 225, Singet dem Herrn, ein neues Lied (‘deehhm’ not ‘dem’! ), that great, joyful celebration Motet for double choir. Its three movements contrast strongly but form a perfect whole, with the middle interposed chorale / aria as an island of gentle song but moving directly into the elaborate ‘Lobet dem Herrn’ and the ‘Alles was Odem hat, lobet dem Herrn’. The pace and intricacy of this movement required careful time keeping, rhythmic precision and aiming for those Pillars of Harmony, those cadences and contrapuntal endpoints, that were so helpful to feel. Speed and volume was not important here, not at all, but rather the all important rhythm and harmony, with clipped and pronounced consonants and energy in the silence. And, oh my, didn’t everything Brian had instilled in us come to play…I heard the individual melodic voice parts mingle, cross and merge hitting glorious harmonic moments over and over again, with garlands of decoration splendidly expounded in this beautiful location. And I heard a precise and understated, supremely Baroque finish, nonchalant in its achievement, ‘It has all been said.’ It was powerful in its simplicity and precision, like the heavenly dome above us. I felt exhilarated and exhausted with the effort, Michael felt the emotion, all four courageous tenors felt the achievement together and knew we had just been part of a special experience for the audience, the church, the whole whole choir, ensemble soloists and Brian. This was one grand masterclass by Brian. The enjoyment and achievement we feel means the next event can’t come soon enough! We missed our absent friends who were unable to join us due to illness and upset they had to pull out. Till we stand together again, my fellow singers. As we approach midwinter, something beautiful has sprung.